Note: All test strips are in original brand name manufacturer packaging. Packaging may differ from that shown here. Do not use any product whose factory seal is missing or damaged. What a bargain price for 50 Bionime blood Glucose strips! 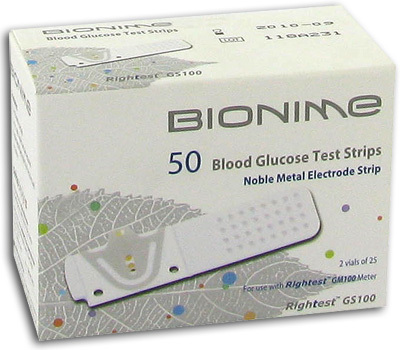 The Bionime GS100 blood sugar test strip applies patented precious metal electrodes which have excellent conductivity and catalytic effect. It is an excellent electro-transmission medium, and laboratory-grade electrode made cheap and affordable for disposable test strips. Working with GM100 Blood Glucose Monitoring System, the blood glucose level can be accurately measured in turn giving diabetes patients the most considerate care.